ANN ARBOR — With all due respect to new Michigan quarterback Shea Patterson, the Wolverines may have the advantage without the ball in the season-opening showdown at No. 12 Notre Dame. With NFL-hopeful players up front, at linebacker and in the secondary, the Michigan defense is experienced, talented and fast. 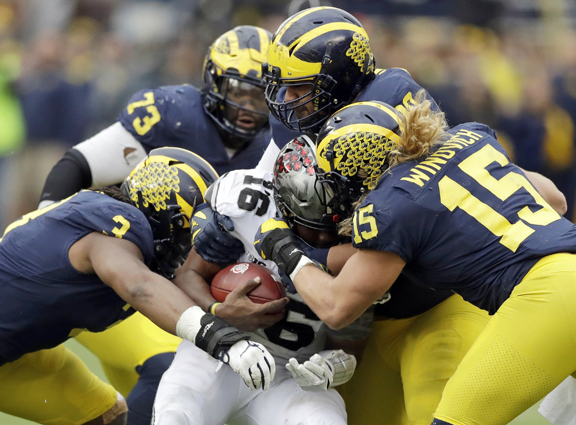 Michigan has nine starters back on defense and eight of them were at least honorable mention All-Big Ten players. Defensive end Rashan Gary is projected to be one of the top picks in the 2019 NFL draft. Last year, the Wolverines ranked No. 1 against the pass and No. 3 overall on defense in the nation and they’re expected to be even better. “They have gotten certainly a lot of the recognition in preseason and deservedly so,” Notre Dame coach Brian Kelly said. The Fighting Irish will start quarterback Brandon Wimbush on Saturday night even though he failed to complete half his passes last season. Wimbush struggled last November after a strong start, losing 41-8 to Miami and 38-20 to Stanford while he averaged 3.2 yards per carry and was 21 of 49 with three touchdowns and four interceptions. He was benched during the Citrus Bowl and replaced by Ian Book, who led a 15-point, fourth-quarter comeback to beat LSU to close out a 10-3 season. Wimbush is at his best on the run. He had 804 yards rushing last season and 14 touchdowns, a single-season record by a Notre Dame quarterback. Unlike last year, Wimbush won’t have running back Josh Adams as a threat in the backfield to keep defenses guessing. Adams ran for 3,201 yards and 20 scores over three years before going pro. If Wimbush has time to pass behind the Alex Bars-led line, he’ll likely be looking one of his 6-foot-4 receivers: Chase Claypool and Miles Boykin. Claypool had 29 receptions for 402 yards and two scores last season and Boykin caught 12 passes for 253 yards and two TDs.